What makes a house a home? The answers vary as widely as our tastes. Everyone senses, experiences and discovers their home differently. This demand for individuality, combined with a young, fresh style, are what make HANSADESIGNO unique. Be it side or top operated, subtle or prominent, touch-free or manually operated, for bathroom or kitchen – HANSADESIGNO redefines variety. But it always feels like home. The HANSADESIGNO range has the perfect fittings for any home. Countless exclusive design types and different functions create an extraordinarily rich variety. All HANSADESIGNO basin models have one thing in common – stylish design down to the tiniest detail. A slim, rounded cross-section often ends in a softly-rounded base. This shape appears almost youthful, yet timeless at the same time; geometrically clear yet gentle. It is a continuation of the softer lines of modern living environments. The models with the innovative Mikado® jet are incredibly detailed. With their extraordinary jet shape, the rosé gold version and the tiny touch-free option make water truly eye-catching. Divided into multiple jets that flow into one another, the water looks delicate and harmonious as it flows into the basin in a net form. As if that were not enough, the Mikado® jet options also save water, using just two litres per minute. With its eccentric colour, the HANSADESIGNO in rosé gold represents extravagance and individuality. It reinforces the effect of stylish design basins. The modern trend colour makes bathrooms especially expressive, emphasised by the elegant, softly-rounded fittings and the innovative Mikado® jet. Because the operating lever is on the side of the fitting, so there is no need to touch the top, the rosé gold surface remains drop-free for longer, making it a shining, eye-catching feature in any stylish bathroom. Design competence comes in threes: HANSA received the coveted GOOD DESIGN® Award 2017 for three products at once. 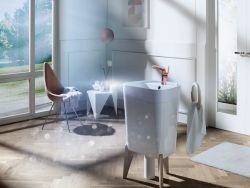 The HANSAEMOTION wellness shower system and fittings from the ALESSI|SELECTION ALESSI Sense by HANSA and ALESSI Swan by HANSA ranges all won awards. All the products impressed the judges with their innovative character and outstanding design quality. The GOOD DESIGN® Award is given to products that bring together functionality, aesthetics, form and material in a special way and meet the demands of innovation. Started by Edgar Kaufmann in 1950, the award is one of the world's longest-standing design prizes. It is awarded annually by the Chicago Athenaeum Museum of Architecture and Design, in conjunction with the European Centre for Architecture, Art, Design and Urban Studies. The judges are respected company representatives and international professionals from the art and design sector. Strong partnerships produce strong brands. As one of the best-known trades brands, HANSA proves this through its close ties to retail and trades. This close partnership produces not just innovative product solutions, but new ways of thinking – inspiration. The brand's latest look, presented by HANSA in eye-catching style at regional trade fairs in 2018, is proof of that. It puts the spotlight on the primary element of water. Competent, innovative and with strong designs – HANSA is famous for these attributes in the sanitary facilities sector. What is new is the brand's look. It immediately shows how inseparable HANSA is from the primary element of water. Both kitchens and bathrooms revolve around the same thing: fittings. A water supply enables a wealth of activities: hygiene, wellness, drinking, cooking, cleaning and much more. With product solutions from HANSA, the elixir of life, water, can be installed. HANSA allows water to be planned, and makes access to it smarter and more convenient. Ultimately, HANSA reflects a young lifestyle. The logical consequence of this link is the derivation of various fields for different target groups from the term ‘water’, such as waterinstallation, waterplanning, waterwellfit and waterstyle. The new look is especially visible in the communication channels and picks up the various target groups where they are. “With more than 100 years of tradition to look back on, HANSA is constantly working to transform the brand, in order to offer that crucial, relevant added value to generations of target groups in the business and end consumer sectors for the long term,” explains Sonja Besler, Manager Marketing & Communication at HANSA. “Customer behaviour has changed a lot over the last few years. New media, new customer touchpoints and the everyday flood of information are putting new demands on communication. Innovative cross-channel marketing concepts are now part of our holistic strategy, putting greater emphasis on new ways of gathering information and ensuring improved customer intimacy. We want to make the HANSA brand better known and make it more approachable and tangible,” continues Besler. Fresh look, strong topics: With H2O, the new online magazine for end users, HANSA focuses on up-to-the-minute content that reflects the real lives and needs of its customers. HANSA's H2O does more than just join end consumers on their customer journey through the digital world. With strong content on lifestyle and everyday topics, the sanitary fittings manufacturer also offers added value for specific target groups. The focus is always on the user and his needs – addressed with true-to-life topics and information on HANSA's broad product portfolio. “In H2O, we want to dive into the HANSA world together and literally ‘experience water’. On the one hand, it enables end users to think about our products in a targeted way. On the other, we make our brand tangible, demonstrate authentic character and anchor HANSA in the users' lives,” explains Sonja Besler, Manager Marketing & Communication HANSA Brand. By getting users excited about the sanitary fittings brand, the company also automatically supports sanitation tradespeople and specialist retailers. Brand loyalty is boosted, demand increases and sales potential is enhanced. From research and development to series production: the production chain for HANSA products in the shower segment is entirely in-house. This in-house expertise guarantees quality and enables individual requirements to be implemented. The HANSAACTIVEJET hand showers are proof of that. They are the result of combined expertise and have been tailored exactly to the needs of modern customers. As part of the Oras Group, HANSA has access to extensive synergies. Collaboration and exchange of expertise within the corporation is encouraged. That benefits retail, trades and end consumers. HANSA gives its customers access to this connected expertise in design, engineering, logistics and production in the form of innovative products that reflect the spirit of the times and ensure the greatest satisfaction. The HANSAACTIVEJET hand showers are a case in point. They are produced 100% in-house and represent pure shower indulgence. Everything comes from a single source. The entire value chain remains in-house. This enables HANSA to contribute its expertise in the shower segment in every key production step and react flexibly to market dynamics. The focus is always on the needs of the users. The HANSAACTIVEJET hand showers, for example, are based solely on the needs of the users, reacting to the mega trend for well-being with difference experience modes. A choice of models with rounded or soft-edged shower heads in the HANSAACTIVEJET STYLE range comes in grey or white. Each is available as a single-jet or three-jet model. For particular convenience, the jet types are chosen intuitively at the touch of a button with clear symbols. The INTENSE jet option is ideal for daily, universal use. Those who prefer more relaxation and pure indulgence can be pampered with the soft, wide-area SENSITIVE SPRAY. The width of the jet means that the entire body is gently covered with water. PULSE SPRAY is the ideal choice for relieving muscle tension. The shower head produces a pulsating, hard jet that massages the affected body parts and banishes the stresses of the day from the user's mind. This fresh kick is activated via a button on the top of the shower head. Be it at work, in everyday life or in sport, those who achieve a lot and put themselves under strain need a chance to step back and bring their body, mind and soul back into balance. That is exactly why the HANSAEMOTION wellness shower system with three therapeutic regeneration functions was developed. It brings the proven methods of warm/cold water treatment into private bathrooms, at the touch of a button. Water as a bringer of health. Relax, recover, recharge the batteries – the HANSAEMOTION wellness shower system helps. It makes the healing power of water tangible for the body. At the touch of a button. Developed in collaboration with medical practitioners, physiotherapists and health experts, HANSAEMOTION with the optional wellness function creates a totally new wellness experience in the home bathroom. At its heart is the HANSAEMOTION thermostat with optional wellness function. A touch of the wellness button in the centre of the thermostat is all it takes to select one of three wellness programmes. Each programme has a different effect on the body in line with our everyday experiences, i.e. is empirical. Athletes, for example, might want an ice bath after training, while workers are more likely to choose the long warm water cycles to relax their muscles. With its long warm water phases and gentle temperature changes, the RELAX function has a calming effect. It helps with relaxation and can reduce blood pressure and levels of stress hormones. With its balanced warm and cold stimuli, the RELOAD function is ideal for stimulating circulation and giving the body new energy. Its users are guaranteed to get the day off to a fresh, agile and active start. In the RECOVER function, intensive cold water cycles create a cool down effect that can help to relax muscles, prevent muscle stiffness and even strengthen the cardiovascular system in the long term. It is the ideal shower solution after sport or hard physical work. Once the programme is finished, the water therapy treatment stops automatically and the water continues to flow at the preset temperature. The function can be interrupted at any time at the touch of a button. An especially practical function is the ability to control the various programmes via the app. Even without the wellness option or as a model for the bathtub, the HANSAEMOTION thermostat is an impressive product. Inside, high-quality, corrosion-resistant DZR brass guarantees a long lifespan. Outside, the soft, pleasantly-curved shape of the underside, the flush wall mounting and the safety glass shelf on the top play their part. The easy-care glass attachment is available in “space grey” or “clear white”. Large, ergonomic knobs accessible directly on the front make the thermostat intuitive to operate. The THERMO COOL function prevents the housing from heating up. As an option, the shower system is also available with a directly-connected shower head, whose rectangular form envelops the body in water completely. The HANSAEMOTION thermostat programme and the wellness applications are perfectly complemented by the HANSAACTIVEJET and HANSAACTIVEJET STYLE hand showers with their round or soft-edged shower heads – each available in a single-jet or three-jet version. The HANSAEMOTION wellness shower system won two design prizes in 2017: the Iconic Award and the GOOD DESIGN® Award. Examining the design process holistically, the German Design Council's Iconic Award rewards visionary buildings, innovative products and sustainable communication in all fields of architecture, construction, real estate and the production industry. Its focus is on holistic presentation. Bending, kneeling, twisting – tradespeople put a lot of strain on their bodies every single day. HANSA collaborates with medical experts to make plumbers' lives easier, not just with innovative product solutions, but with further added value. The key question is, how can we ensure that tradespeople stay well? In an interview, Dr Adrian Busen tells us how stress and forced postures can be prevented, which measures are useful, and what chiropracters can do. What does the term “well-being” actually mean? It means feeling good, mentally and physically, in whatever we do every day, be it leisure or work. Is it a good idea to look at body and mind as a single entity in our job? It is a good idea, but not very practical. The only way for me to gain enough energy is if I face regular physical and mental challenges and do not have to repeat the same processes at work every day. After work, your battery should be run right down. But this is often difficult in practice. If a two-metre-tall plumber who is also involved in customer service pops in to see me, I cannot tell him that he needs to end each day with 30 minutes of back exercises. All he wants to do when he gets home is have something quick to eat and lie down – understandably. In the morning, body (shattered) and mind (dreading dashing from customer to customer on the congested streets and kneeling for hours in uncomfortable positions under basins) are completely out of kilter. All I can do is release the pressure on his back, prescribe some painkillers and wish him all the best. As you mentioned, plumbers and HVAC technicians have a back-breaking job. Time pressure, excessive work, changing locations, difficult-to-reach areas – exhausting! How can I spot stress and what are the consequences? Every individual feels stress differently. One the one hand, each person can cope with a different level of stress. On the other, we filter stress through our bodies differently. It has a huge range of symptoms, from top to bottom: headaches, eye twitches, anxiety, muscle tension, digestive problems and even heavy feet. You have to know yourself very well to pinpoint the stress – and you have to admit it, or talk about it and reflect on it with your doctor. Long-term stress is extremely damaging, because it tightens a psychosomatic screw that eventually becomes very difficult to loosen again. A stomach ulcer caused by stress is not noticeably different from one caused by other factors. Plumbers spend a lot of time working in uncomfortable positions (forced postures). What happens to my body when I do this? How can I stay physically fit despite it? A forced posture or very repetitive movements often cause muscle tension and excessive strain on the musculoskeletal system. The locomotor system stops working as it should. Avoiding these movements, which are often wrong but are essential to the work, appears almost hopeless. If I crouch under the basin with a head torch, of course I notice it afterwards. That is why I always tell my patients that their problems are usually a logical consequence of the movements they make. So, make conscious movements, take short breaks, and eat and drink enough. The most important factor in staying physically fit is to undertake some kind of sporting activity outside work to stabilise the body. Understandably, this is a real challenge for most people. What exactly this activity should be for the various trades is a question to discuss with a doctor or physiotherapist. Bending, lifting, kneeling, crouching, twisting – how should I do this and what do I need to be aware of? As a general rule, every movement should involve the entire body, not just a small part. This can also be learned through chiropractic treatment. The specialist term for this is a stereotypic movement. It is incredible how many muscles are triggered by the nervous system just to make the simplest movement! Standing, kneeling or crouching for long periods – how can I prevent strain? Bending is a good start (laughs). And stretching every so often. Always put the same load on the opposite muscle. If we are working in a bent posture, we need to stretch and release the pressure now and again. Just like on a long journey: have a walk around occasionally, rock from your heels to your toes. Always keep the blood pumping around the muscles in your legs. After work, put your feet up and massage your legs. Using knee protectors when kneeling is definitely recommended. At the weekend, why not visit a sauna and plunge pool – or take alternating hot and cold showers at home. So warm and cold water therapy can support physical generation and prevention? Exactly, showering alternately in cold and warm water really does help. It gives the vegetative nervous system and thus the entire vascular system a varied input and helps the body to regulate its circulation. And the best thing about it is that we can use the cold/warm water therapy in our own bathrooms whenever we want. Are there any other exercises I can do when I have a minute to reduce the strain on my entire body? Hanging from a bar, for example in a door frame, is very good. Shouting, singing or laughing loudly all help, too. Of course, that might be difficult in some situations and depends on your colleagues, but if it is possible, it is a great form of release. What does a healthy lifestyle look like in the context of a work-life balance? One thing is always underestimated: we should fill our free time with activities that distract us from our work. In an ideal world, when we are driving to work in the pitch black at 6 am on a Monday, we should be able to say, “What a great weekend – it was fulfilling and added value to my everyday life. Now I am ready to face anything!” But that is setting the bar very high (laughs). With which pains should I see a doctor or chiropractor? How can the therapy help? If the body cannot rectify a severe block or muscle tension itself, say within 72 hours, you should go to a chiropractor. He can usually improve the function straight away and give advice on follow-up treatment. Pain relief or a muscle-relaxing treatment might be needed in the short term. Dr Adrian Busen is a general practitioner in the Dr. Münster practice in Münster, Westphalia. His focus is on preventative medicine and promoting health. Dr Busen works in the field of chiropractics, focusing on atlas therapy (atlasReflexTh.®), and is also a dietician and (DAEM/DGEM® and expert in travel medicine (CRM). Fitting bathrooms simply, holistically and reliably – a service that is in more demand than ever in today's housing market. HANSA's preconfigured solutions ensure exactly that. Thanks to well-considered combinations of premium product solutions for basin, shower and bath tub, entire bathrooms can be built, refurbished or renovated economically and flexibly. The Living Trends Report 2030* predicts significant future developments for planners and decision-makers. One key change they will have to get used to is housing areas and quarters that, in our “25-hour active society”, are places of relaxation, health and progress all at the same time. As work becomes more and more intense, people's homes provide a vital place to relax and recover. One spotlight is on the bathroom, whose fittings and enhancement is becoming increasingly important. However, construction and renovation today no longer tend to focus only on a single apartment or building. Instead, decisions are often made to fit in with the development of an entire quarter. That means there is even more demand for contemporary complete solutions that ensure fast, flexible planning and implementation. To do this, HANSA has created seven fittings packages that cover every requirement of the housing market and property construction individually and at little expense. Thanks to high-quality workmanship, simple installation, durability, economical water consumption and ease of maintenance, plans remain good value in the long term. In addition, the products impress demanding users who value design, comfort, sustainability and health. The five comfort packages incorporate two design lines whose timeless looks allow them to fit in with a wide range of bathroom concepts and that impress with simple installation and long-lasting results. HANSAPINTO for design-conscious, sophisticated and distinguished solutions with added value. HANSAPOLO as a comfortable standard solution with a simple, functional character. The fittings packages are complemented by practical HANSA functional hand showers as an additional water source for the basin, as well as products for bath and shower. Options include the especially water and energy-saving HANSAMICRA thermostats with intuitive and accurate temperature setting, THERMO COOL housing and 38°C safety lock as reliable protection against scalding. Products from HANSABASICJET shower range can also be connected. The single-jet hand showers with straight-line design, clean geometric lines and soft edges are especially light and easy to use. High-quality silicon studs prevent limescale deposits on the shower head, making the products easier to clean and keeping them working well for longer. One key advantage of the wall-mounted shower rods for shower and bathtub is the fact that they can be adjusted to any height. This enables them to be adapted to any wall situation and prevents unnecessary additional work during installation. HANSA also offers two standard lever mixer packages for bathtub or shower in the HANSAPRIMO range. * GdW (Federal Association of German Housing and Real Estate Enterprise Registered Associations) Industry Report 6.